On this, the twenty second day of the month, I would like to express gratitude for everyone’s friend Billy Shakespeare. He’s a wacky kid with a penchant for telling tales that transcend time and culture. 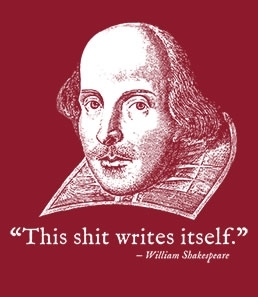 Among his plays, Shakespeare also penned over 150 sonnets, making him the grand poobah of the genre and for good reason! Here’s my humble attempt to pay homage to the master of the craft. Thank you. Entertaining masses, but whom to thank? Written on pages with immortal ink. Your thirst shall be quenched from canon Shakespeare.